The watermelon diet is not an official diet. However, including a lot of watermelon in your diet can be a useful weight-loss strategy. Watermelon consists of 92 percent water and contains 2 g of fiber per half-cup serving. Water can help you lose weight by curbing your appetite, flushing out toxins and improving your digestive system. 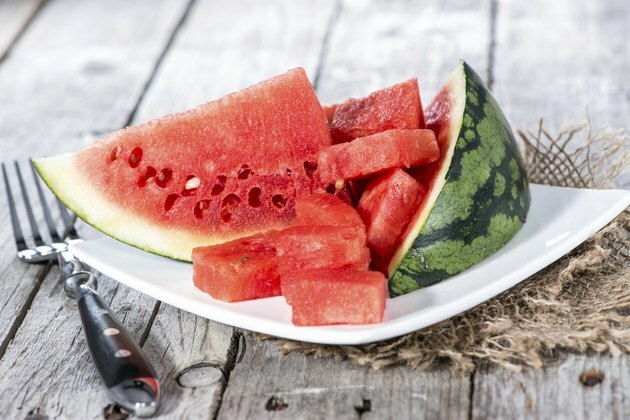 Part of what makes watermelon such an effective weight-loss tool is that you are getting a lot of water while eating it, and the act of chewing and swallowing helps you feel as if you ate more calories than you actually did. It also contains natural sugar to help curb a sweet tooth. The fiber contained in watermelon can also help you lose weight because it helps you feel fuller for a longer period of time, so you avoid overeating. Replace sugary fruit juices and soda with watermelon and water. Cut up half a cup of watermelon into small chunks and freeze them. Then place them into a glass and add water. The watermelon will act as ice cubes and flavor your water. You can snack on the watermelon chunks as you drink the water. There are about 110 calories in a cup of orange juice and about 120 calories in a cup of apple juice, while there are less than 50 calories in this watermelon beverage. Reduce portion sizes during your typical meals. Eating smaller portions is one sure way to cut calories and lose weight. Watermelon can help you actually achieve this goal instead of feeling extra hungry later and bingeing. Simply add a couple servings of watermelon to your reduced-portioned meals to trick your brain into thinking you are eating just as much as you were before. In reality, you can eat as much food but are replacing higher calorie foods with watermelon. This will drastically reduce your calories without deprivation. Eat watermelon for dessert. Watermelon contains beneficial vitamins and minerals for your health. It also contains eight percent sugar, which makes it extra enjoyable to eat. Snack on a slice or two as a sweet treat instead of high calorie cake and ice cream.